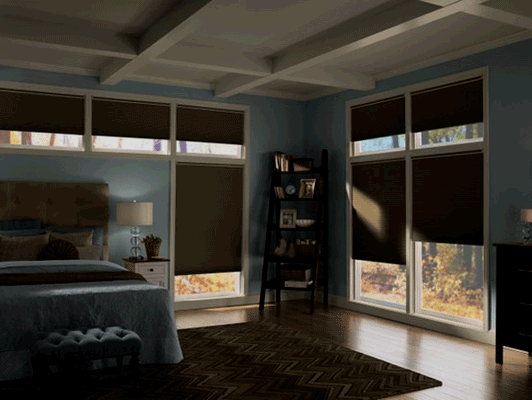 Blackout cellular shades come in all of your favorite colors and fabrics – with the added benefit of room darkening! They can also be ordered in a variety of control options such as top-down / bottom-up, cordless, motorized and more. Blackout roller shades actually are lined with an extra layer of opaque fabric that makes them one of the best room-darkening window treatments. Known for their ease of operation, black out roller shades offer one of the most convenient methods of eliminating light from any room. Roman shades are ideally suited to room darkening – because they are virtually “gap free”. Constructed of one solid piece of fabric – and additionally lined with an opaque light blocking fabric – blackout roman shades look elegant whether up or down – but almost completely darken any room. Blackout drapery panels add an unseen layer of light blocking fabric to the classic look of draperies. For the absolute ultimate in light blocking, you can also add a blackout drape over a blackout shade! Get the best sleep – any time of the day or night – with bedroom blackout shades and drapes. Add top-down / bottom-up capability – or motorization – to let light in ONLY when you want it. 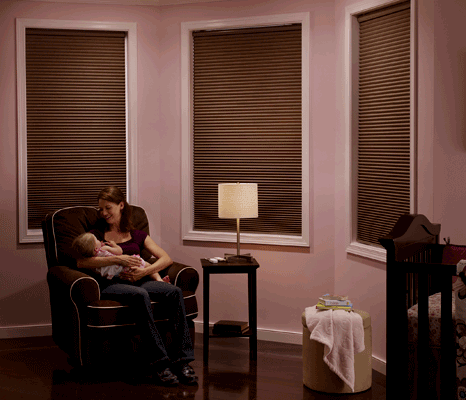 Allow your child to nap better – no matter how bright it is outside – with nursery blackout blinds or drapes. Blackout shades for your nursery or child’s bedroom also help children fall asleep earlier on long summer days – especially during daylight savings time. 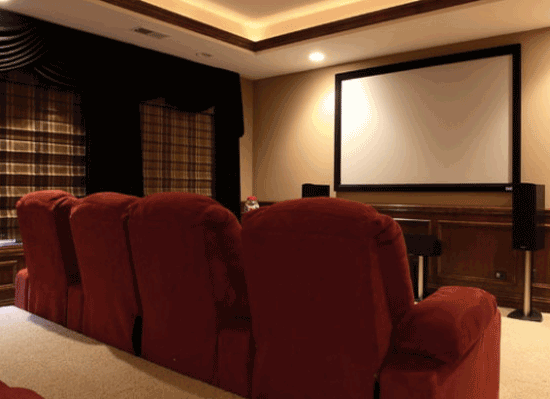 Nothing improves the viewing experience in your media room like blackout shades or drapes. Eliminate annoying glare and get that crystal clear HD picture on your screen without the interference of unwanted light! We offer a wide selection of window shades and window blinds constructed from natural fabrics that balance a casual look and feel with design flair and functionality. Canvas window shades, linen window shades & woven wood blinds are just some of the natural window treatments we offer that are durable, functional & beautiful!